The Fund awarded Salisbury Library and Galleries a grant of £2,750 towards the purchase of the above watercolour by the Indonesian-born artist. Additional funding (total cost £8,000) was made by the Art Fund and the Edwin Young Trust. 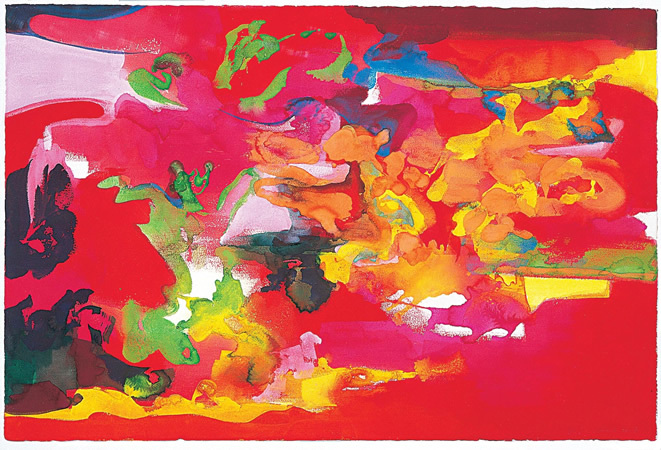 ‘Fiesta’ is a large enveloping work that draws you into a sea of colour. The palette of colour is intense and personal, floating and gestural. It is predominantly red and pink with yellow, orange, marked with green and blue. The whiteness and texture of the paper support the colour and enhance its luminous quality and atmospheric liveliness. Although the work is abstract it undoubtedly is based on reality and events. It has a structure that is fluid, yet clearly defined across the whole field of the work. The ‘Water-paint’ as the curator describes the medium, is free, yet controlled, allowing the pigment to congeal and create special effects. There is a sense of music and excitement echoing with the works of Kandinsky painted in response to music. They have a contemplative quality and ‘speak to the realm of the emotions’, and have been described as ‘a joy to see’. ‘…Nerys Johnson had a keen interest in using the arts in education and the collection recognises the generous contribution her trust has played in making this acquisition possible. (Salisbury Library & Galleries press release, February 2008).